To maximize the efficiencies of panelization and get the most out of off-site construction, there are a few key elements you must consider. 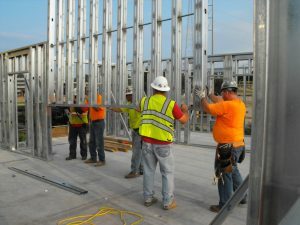 Panelization — the ability to assemble wall, floor, and roof sections off-site in a controlled environment — is frequently used in cold-formed steel framing projects and provides many advantages, from minimizing costly weather delays to ensuring greater quality control. This innovative construction practice has helped numerous projects, such as Poly Canyon Village and, more recently, 2016 CFSEI Design Excellence award winner The Wharf in Washington, D.C., come in ahead of schedule and under budget. According to Don Allen, P.E., LEED A.P., an internationally known expert on cold-formed steel, panelization can shave as much as 75 percent off a construction project’s field time. But to maximize the efficiencies of panelization and get the most out of off-site construction, there are a few key elements you must first consider. Off-site construction example 1For panelized projects, more time is needed on the front end — so above all else, you must be involved in the very early stages of the project. Depending on the size and scope of the job, you typically need six to 12 weeks of lead time for planning purposes (as opposed to the one to four weeks usually required for stick-built projects). If you want to use panelization, you can’t wait until the foundation is poured and the structural steel is ordered. Start early. You can either have a panel fabricator provide a complete quote, or you can choose to perform the estimate yourself. 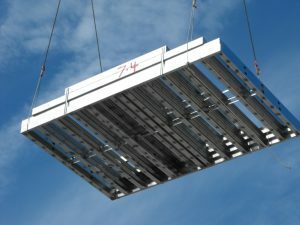 Either way, your total bid will need to include the cost for material fabrication and delivery of panels to the job site; sealed engineering calculations (if required); panel shop drawings and quantity breakouts; panel quantity; estimated number of loads and deliveries along with the lineal footage of panels; the square footage of the panels so that sufficient installation productions can be calculated; and transportation and shipping costs. Having the correct sequencing in place is critical and should follow in order the sequence for installation, for trucks and delivery, and for fabrication. Panel fabrication is based on the installation sequence, meaning the first panel to be installed gets fabricated last and is at the bottom of the stack. This limits any potential damage during handling as well as the need for on-site storage, and it keeps the project moving smoothly. A panelizer should pre-build the project on paper or in a computerized drawing, coordinating key dimensions with structural, architectural, and sometimes mechanical drawings. This step is very important because once you’re out in the field, repairs are double or triple the cost, and they likely impact multiple panels. Shop drawings must be approved as specified in the contract documents, and must be reviewed and accepted (or rejected) by the structural engineer of record (SER), architect and general contractor. These drawings are designed to make it very easy for shop technicians to assemble, because they’re able to determine exactly what pieces go where and how long they are. As a result, the level of skill required to assemble a panel in a panel shop is lower, and therefore less expensive. Off-site construction example 2Panelization projects require coordination and communication; otherwise, you can delay a project and cause unnecessary headaches and expenses. This includes early coordination with the mechanical, engineering and plumbing (MEP) trades, since these panels will need to be pre-built. Panels are often welded together by the time you get in the field. So, if you fail to coordinate and discover on-site that you have to adjust a panel for a dryer vent that needs to go through or a plumbing riser, you lose many of the advantages of panelization. When planning for transportation and shipping logistics, you’ll need to use panel counts and sizes to determine the number of loads that will be required to deliver the panels to the job site. Be sure to include per-load costs of time, fuel, and permits. And keep in mind, when shipping panels, you fit less material in a single truckload than if you are sending bundles of individual studs to the site.